My project aims at improving radiation therapy treatment for lung cancer patients by better understanding the functional and structural response of the lung tissue to ionizing radiation. 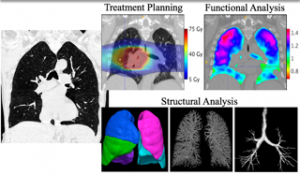 This work is centered around designing robust image processing algorithms to automatically extract quantitative information characterizing lung biomechanics, kinematics, and structural properties from large 4D (3D + time) pulmonary computed tomography (CT) datasets. The ultimate goal is to better understand how these quantitative measurements are correlated with radiation dose and use this to build predictive models that can be used to improve treatment outcomes by reducing complications associated with radiation. This information will be used to improve our understanding of pulmonary physiology, function, and biomechanics. This research will better our understanding of how pulmonary function is effected by radiation; additionally, this knowledge could be translated to gain insight on how pulmonary function is effected by other environmental stimuli such as pollution, gravity, or humidity.